We know it is important that the blanket stays on and covers your baby down to his or her toes! The blankets are designed to attach to the five-point harness of most strollers. They should drape over the sides of the stroller so the rain or snow rolls off. The blankets are not intended for use with car seats. There are two different ways you can attach the blanket to a stroller with the ribbon attached on the fleece side of the blanket. 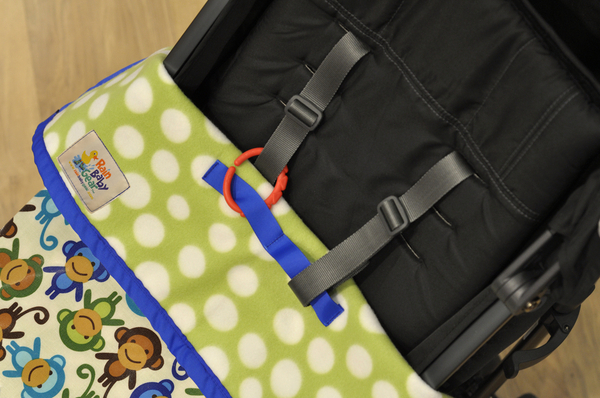 (1) You can feed the stroller’s harness straps through the ribbon loop on the fleece side of the blanket. Then just clip the harness buckles closed as you would otherwise. (2) You can use plastic rings (not included) to connect the blanket to the five-point harness. Clip the plastic ring (shown in red) through the ribbon loop, and then clip the plastic ring around one of the harness straps (shown in grey.